Motorsports enthusiast Megan Jackson first learned about a NASCAR competition last year when she built displays at a viewing party for a race that was hosted by teams from Indiana State University, where she is a student. This semester, it's her turn to be part of the group of Sycamores pitted against teams from other universities across the country. A group of five students is competing in the semester-long NASCAR Kinetics: Marketing in Motion contest, a collegiate competition in which university teams complete case studies based on NASCAR projects and host an official viewing party for a race. The ISU team this semester completed two case studies and hosted a viewing party for the Good Sam Club 500 at Talladega Super Speedway on Oct. 23. "The surprise for me was the level of involvement with NASCAR that we actually received," Jackson said. "They did three or four phone calls with us. They were responding to our e-mails with any questions we had. They were actually a lot more helpful than I expected." The team participants this semester are Jackson, a senior majoring in technology education from West Terre Haute; Lindsey Butorac, a senior business management major from Bloomington, Ill.; Tony Stevenson, a senior majoring in information design and end-user computing from Avon; Dan Savka, a senior majoring in public relations from Indianapolis; and Sydney Valandingham, a junior majoring in marketing from Terre Haute. In the first case study, the NASCAR Kinetics teams utilized social media to promote the Michael Waltrip Racing organization. They tried to conceive creative ways to encourage fans to visit the group's website, and also had to create a promotion for the group's partnership with Aaron's, said Stevenson, who is the ISU NASCAR Kinetics team leader. In the second case study, the teams needed to promote the relationship between Dodge and NASCAR, which included utilizing a variety of ways and places to get the word out, from race tracks and stores to social media websites on the Internet, Stevenson said. "It's definitely challenging," Stevenson said of the competition. "You work a lot with tight, close deadlines that you really have to meet. It's really a good experience, as far as actually getting out there and working on hands-on projects." This year the competition includes 20 collegiate teams nationwide. Each team needed to complete the case studies as well as host a viewing party for a NASCAR race, which counts for half of a team's overall score. The ISU team hosted the viewing party at the Buffalo Wild Wings on U.S. 41 in Terre Haute. They gave away food and had drawings for prizes. The Indianapolis Motor Speedway also brought a pace car that people could view, and the U.S. Army brought a vehicle, which included the NASCAR video game that people could play. In past events, the ISU team hosted viewing parties at the Zorah Shrine Temple near campus. About 200 people visited those events, said Joyce Young, professor of marketing who co-advises the NASCAR Kinetics team with Kim Bodey, assistant professor of recreation and sport management. More people visited the viewing party site this semester, since it was held in a public venue. "There were at least 500 to 800 people throughout that time, coming and going," Young said of this semester's viewing party at Buffalo Wild Wings. "So there were at least 500 people who were made aware or reminded of NASCAR, and that was certainly a bigger number that we had in the past." ISU has a track record of success in the competition. Last fall, Indiana State's team won the competition, which included a trip to the Ford 400 race in southern Florida last November as the winning prize. The students on the team had a chance to network with NASCAR officials and other members of other racing organizations; the group also watched the race and participated in other festivities occurring through the weekend. The experience benefited students in a variety of ways, including helping them hone the time-management skills that were needed, as the students had to complete the contest's tasks while balancing the rest of their schedules, said Sarah Adams, a team member last fall. She has since graduated and currently works for John Force Racing. "It was really difficult to juggle work, school, family and this project all at the same time, but that's something you have to learn, because that's the way real life is," Adams said. "Learning how to manage your time and a real-world schedule is extremely important and will always be that way. Because adding the NASCAR Kinetics: Marketing in Motion made our schedules more complex, it made winning the challenge all the more rewarding in the end." The team is nearly finished with all their work, and will learn the final results of the semester's competition later this month. 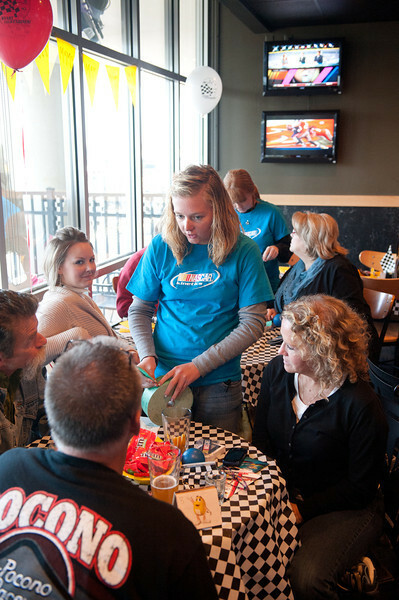 Indiana State University student Megan Jackson speaks with attendees at the ISU NASCAR Kinetics team's viewing party for the Good Sam Club 500 at Talladega Super Speedway on Oct. 23. 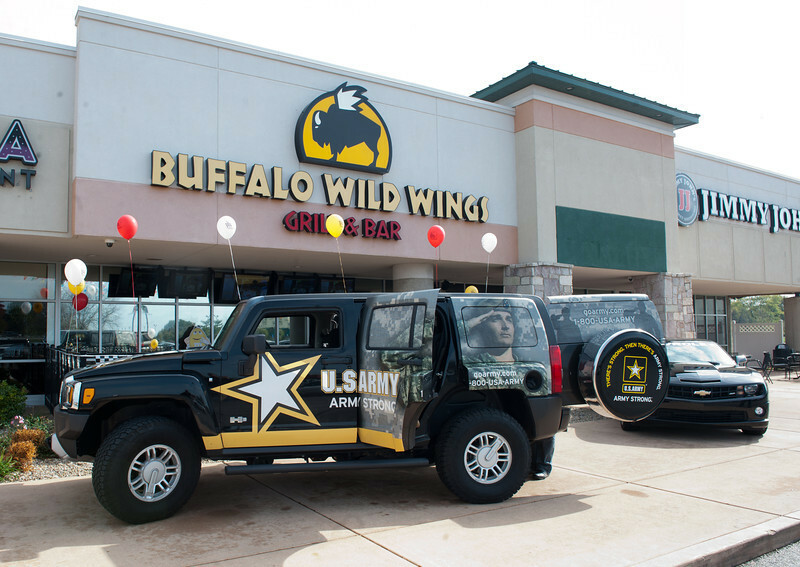 The U.S. Army took a vehicle, left, to the NASCAR viewing party hosted by the Indiana State University team participating in the NASCAR Kinetics: Marketing in Motion competition. The Indianapolis Motor Speedway also took a pace car to the viewing party for the Good Sam Club 500 at Talladega Super Speedway on Oct. 23. The ISU team hosted the part at the Buffalo Wild Wings on U.S. 41 in Terre Haute. Contact: Joyce Young, professor, marketing, Scott College of Business, Indiana State University, 812-237-2035 or joyce.young@indstate.edu. A group of five students is competing in the semester-long NASCAR Kinetics: Marketing in Motion contest, a collegiate competition in which university teams complete case studies based on NASCAR projects and host an official viewing party for a race.